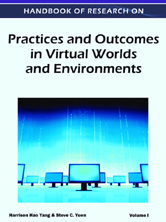 Handbook of Research on Practices and Outcomes in Virtual Worlds and Environments not only presents experienced professionals with the most recent and advanced developments in the field, but it also provides clear and comprehensive information for novice readers. The handbook introduces theoretical aspects of virtual worlds, disseminates cutting-edge research, and presents first-hand practices in virtual world development and use. The balance of research, theory, and applications includes exploration of design innovations, new virtual reality technologies, virtual communities, pedagogical design, and the future of virtual worlds and environments.